The painting “Oak and Dryads” was painted by Kazimir Malevich in 1908. This period of his work is considered early, then he had not yet moved on to Suprematism, which made him famous throughout the world. The art historians define the style of this painting as symbolism. The painting, in which Malevich addresses ancient mythological subjects, is currently kept in one of his private collections. Many Russian and foreign artists in their works appeal to the image of a mighty strong oak. 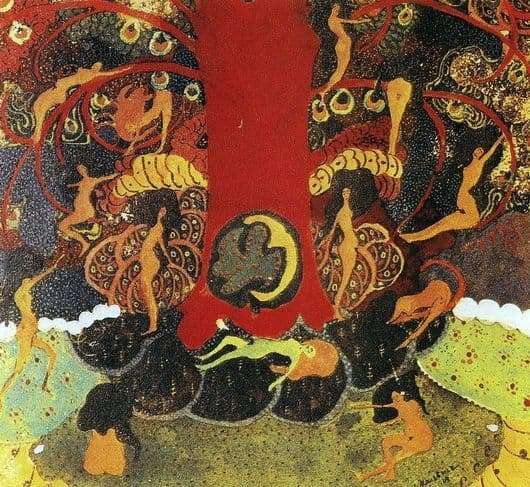 K. Malevich’s Oak and Dryads is a painting on a fabulous theme in folklore performance. The canvas depicts a bright red thick mighty oak with wide sweeping branches. Malevich made oak red because of the frequent use of this color in folklore painting. It is also assumed that the oak is red because its autumn leaves are burning red. On mighty branches and on the ground under an oak tree, the girls of extraordinary beauty, the dryads, are located in the most diverse poses. They are mythical creatures. They live in oak and guard it. In the dryad picture – tree spirits – they frolic, they swing merrily on the branches of the oak, jump and dance. Long shots of black and red hair flying in time with their movements. One of the young dryads, running into plenty, weakened lies under an oak tree, saving up strength. Dryads personify the soul of the tree, while they are here – the oak is alive and full of energy. On a light green meadow at the foot of the majestic oak, Malevich writes flowers in a rather schematic way. Mighty oak, transferred to the canvas, for the artist is a symbol of life (as well as for many other artists, writers and poets). It is also a symbol of life for dryads, because it is their home, a quiet and peaceful place, a haven of solitude. Life symbolism emphasizes the image of huge acorns in a large number of hanging from the branches of a tree. They are surrounded by a bright halo.